Germany stomped Portugal 4-0 on Monday, and it seems as if the whole city of Berlin was watching intently. The chart above—from the city's public water utility—shows water usage from 6 p.m. on the day of the game to 6 a.m. 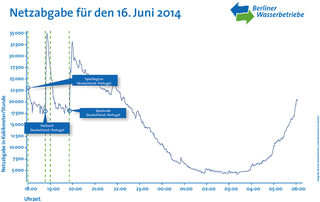 In two dramatic spikes, coming at halftime and at the close of the game, water consumption nearly doubled. Lots of pee was being held.